Despite a worldwide awakening on the scale of the longstanding propaganda against the Syrian government, the British media is still peddling monstrous lies to the public, casually placing the blame on the government of Bashar al Assad. 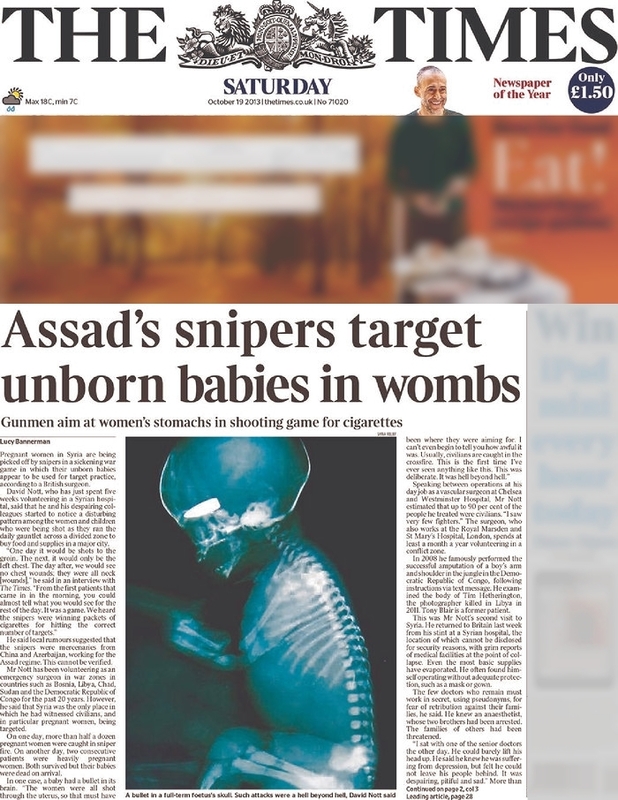 Pregnant women in Syria are being picked off by snipers in a sickening war game in which their unborn babies appear to be used for target practice, according to a British surgeon. David Nott, who has just spent five weeks volunteering in a Syrian hospital, said that he and his despairing colleagues started to notice a disturbing pattern among the women and children who were being shot as they ran the daily gauntlet across a divided zone to buy food and supplies in a major city. He said local rumours suggested that the snipers were mercenaries from China and Azerbaijan, working for the Assad regime. This cannot be verified. Mr Nott has been volunteering as an emergency surgeon in war zones in countries such as Bosnia, Libya, Chad, Sudan and the Democratic Republic of Congo for the past 20 years. However, he said that Syria was the only place in which he had witnessed civilians, and in particular pregnant women, being targeted. On one day, more than half a dozen pregnant women were caught in sniper fire. On another day, two consecutive patients were heavily pregnant women. Both survived but their babies were dead on arrival. A group of 55 doctors and medical professionals, including three Nobel Prize winners, will warn this week that Syria’s healthcare system is “at breaking point” because of attacks on hospitals, staff being attacked, imprisoned or fleeing the country, and humanitarian organisations being denied access to patients. In an open letter to the Lancet, to be published on Friday, they say that large parts of Syria are completely cut off from any form of medical assistance. The signatories, who span five continents, cite figures suggesting 469 health workers are currently imprisoned and about 15,000 doctors have fled the country. In Syria’s largest city, Aleppo, there are just 36 physicians, compared to 5,000 before the civil war began, they say. “We are appalled by the lack of access to healthcare for affected civilians, and by the deliberate targeting of medical facilities and personnel,” the letter says.